In the wake of buckling markets, banks knocked to their knees, and massive amounts of presumed wealth revealed as the product of self-deception and breathtaking criminality, an age of indulgence has dramatically impacted American life. Economically, we understand how it happened, but why it happened is more of a mystery. 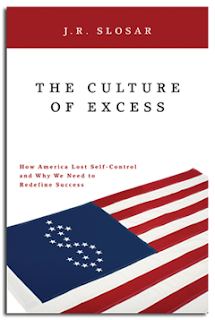 What psychological factors fueled the years of excess and, more important, how do we refocus ourselves for a more rational, self-controlled future? As J.R. Slosar shows in this urgent, sometimes startling volume,the nation’s fast-and-loose approach to money was, in fact, a symptom of a more widespread pattern of excessive behavior. In The Culture of Excess: How America Lost Self-Control and Why We Need to Redefine Success, Slosar portrays an America where the drive to succeed and the fear of missing out manifested itself not only in self-entitled corporate fraud, but in everything from sharp rises in obesity and cosmetic medical procedures to equally troubling increases in eating disorders, panic attacks, and outbreaks of uncontrollable rage. I was a little nervous a about reading and reviewing this book. While I don’t have, much I am was sure some of my traits could fall into the excess category and it is not always easy to read that about yourself. However, when I got the book I happily picked it up and started reading. A few pages in I found my nervousness was unfounded. While yes I did have a few of the traits mentioned I was happy to see I didn’t have too many. Dr. Slosar displays his information on the “me” generation very well and lays it out in an easy to understand manner. There are many points in this book that I fully agree with. We have done something wrong in this country after all look at how it sits financially, how much debt there is and how many homes are not empty. Dr. Slosar said it right when he said we need to move towards a “We” generation. That we need to see the bigger picture and work away from this tunnel vision. I am thankful I got a chance to read this book. This entry was posted on Wednesday, January 27th, 2010 at 8:29 am	and is filed under Uncategorized. You can follow any responses to this entry through the RSS 2.0 feed. You can leave a response, or trackback from your own site.